‘Killer!‘ is a compilation of top-notch sounds from Vandalism. This set brings you 64 fresh and amazing presets for NI Massive and includes sounds for the most popular genres such as Progressive, House, Dutch, Electro, Acid and Minimal. This soundset is for all producers looking for unbelievable and the best sounding presets! 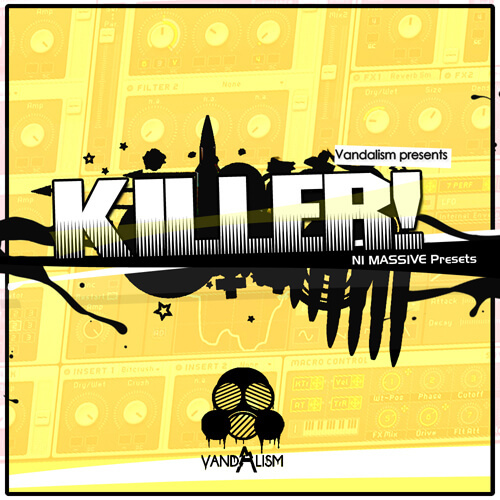 ‘Killer!’ is a mix of totally fresh sounds for NI Massive. Vandalism provides you 64 perfectly designed presets, all with macro controls like cutoff, envelope decay, effect amp or reverb. If you need sounds which you haven’t heard before, this pack is obviously for you! Product contains different types of sounds and includes basses, leads, plucks, effects and chords.